Does the Location of Line-Dash-Wedge Notations Matter? In Line-Dash-Wedge notation, when illustrating that an atom or bond is directed towards or away from the viewer (solid triangle for coming forward, dotted lines for going back), does the location of these lines matter when doing illustrations? 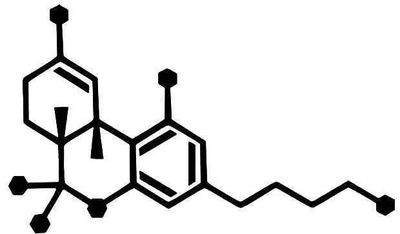 For example, a THC molecule. The two hydrogen atoms there. Could they be placed inside the carbon rings instead of appearing outside, like below? I understand that there's a whole host of issues with that otherwise, but just asking about the triangle and dashes in particular. Yes, both inner and outer placements are possible with some nuances. Stereogenic centers at ring fusion atoms should be drawn with hashed wedged or solid wedged bonds to the exocyclic substituent at the fusion atom whenever possible. If necessary, an implicit hydrogen should be made explicit in order to provide an exocyclic substituent to bear the hashed wedged or solid wedged bond. When one of the fusion bonds is oriented vertically and the exocyclic substituent is graphically small (such as a hydrogen or a methyl group, or even such physically larger substituents as a phenyl group represented with a graphically small “Ph” group label), the exocyclic substituent is also preferentially oriented vertically and opposite to the vertical fusion bond. This orientation is preferred even if it results in the substituent being placed within the ring system, and is particularly common in the depiction of steroids and other natural products. Ring fusion atoms already have three bonds within the ring system. For external ring fusion atoms, the substituent should preferentially be positioned outside the ring system and oriented so that it bisects the angle between the adjacent bonds. When two substituted fusion atoms are adjacent, placing both substituents outside the ring system will typically cause them to overlap. In those cases, it is better to draw one of the substituents within the ring system. A substituent drawn in this way should preferentially be drawn exactly vertically or horizontally, whichever direction would minimize overlap with other atoms and bonds. If a substituted fusion atom is adjacent to an unsubstituted fusion atom, there typically is enough room to orient the substituent either inside or outside the ring system. That substituent should be oriented outside the ring system if all substituents can be oriented outwards, but should preferably be drawn exactly vertically or horizontally if any other substituent is placed within the ring system to avoid conflict with an adjacent substituent. Small substituents on the C-8 and C-9 atoms of steroids should be drawn within the ring system in this fashion even if there are no substituents on the adjacent fusion atoms C-10 and C-14. 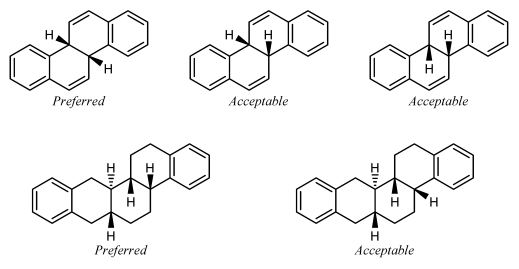 Certain other natural products  also have preferred orientations that place substituents within the ring system. A substituent should not be oriented within a ring system when attached to a fusion atom that lacks any vertical or horizontal fusion bond. The substituent should be oriented outside the ring system, minimizing overlap as best as is possible. Sometimes, it might be possible to reorient the ring system so that the fusion bonds are vertical; the substituents should certainly be placed vertically if so. It is not acceptable to orient two substituents within the same ring if the ring has fewer than eight atoms. One or both of the substituents should be oriented outside the ring system, minimizing overlap as best as is possible. Substituents on interior fusion atoms have no option other than being drawn within the ring system. As above, such substituents should preferentially be drawn exactly vertically or horizontally, according to the direction that would minimize overlap with other atoms and bonds. Not the answer you're looking for? Browse other questions tagged organic-chemistry bond stereochemistry notation or ask your own question. Does the arrangement of atoms around a chiral carbon matter? Does all organic matter originate from organisms? When does a reaction equation require the reversible sign and when does it not? R,S Configuration of asymmetric carbon atom when group priority 3 and 4 are not on wedge bond? What does the colon in µ-η2:η2-O2 mean?